Hi, everyone! Justin at PlayStation.Blog invited me to help celebrate the upcoming PS4 release of Cyan’s game Obduction by doing a question-and-answer session with Rand Miller, CEO and lead designer of the game. I have been playing Rand’s games since the 1990s, and Myst and Riven were both huge influences on The Witness. I felt like this was a good opportunity to ask some serious design questions, so here goes! Jonathan Blow: One very obvious trend, looking at the series of games from Myst through Obduction, has been the advancement of technology. Today’s consoles are insane supercomputers compared to the machines people played Myst on, back in the day. There are some obvious benefits, like the fact that you can walk around the world of Obduction in full realtime 3D, whereas the original Myst was a series of 2D images. I’m interested in how this affected puzzle design. The advantage of something like Myst is that you can curate each individual image very closely — you know exactly where the player is standing and what she’s looking at, and if you want to make some important clue more obvious, it’s clear how to do that. When building things to be explored in full 3D, it’s a much less-concrete discipline because you don’t exactly know where the player is coming from. How do you deal with that? Does it affect the basic design of the puzzles in some way, or is the difference more down to the way specific details are authored? This isn’t Cyan’s first realtime 3D game; both Uru and Myst 5 were 3D, but I would describe those as occurring in the earlier days of 3D when it was at least a little daring to make a 3D puzzle adventure game. How have things changed between those games and now? Rand Miller: The nature of exploration/adventure games is that you want the player to feel like they have complete freedom, but at the same time provide some kind of path guidance that insures that the player gets the story/information they need. I think we’ve learned as we’ve transitioned to realtime 3D that the path guidance that we might have previously achieved on a “per frame” basis, we now have to do on a different scale. I’ll give some specific examples. Early in Riven there was a gate that was locked. It wasn’t immediately evident, but the player could slide under the gate. 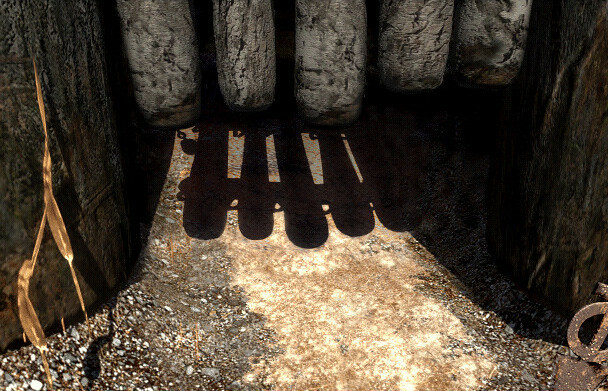 We placed a dagger in the ground under the gate to draw the player’s attention to that lower area. 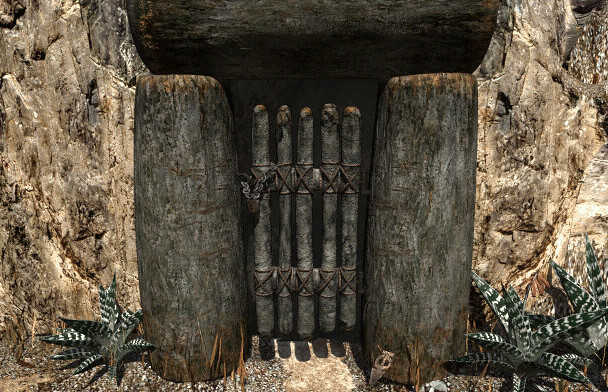 Further, if the player clicked on the dagger the player’s point of view changed to a view of the gate from a much lower perspective – a view that seemed to suggest that they might be able to crawl under the gate. That example precisely illustrates how, by having control of the view we could move the player forward in subtle ways. But that doesn’t work for realtime 3D. 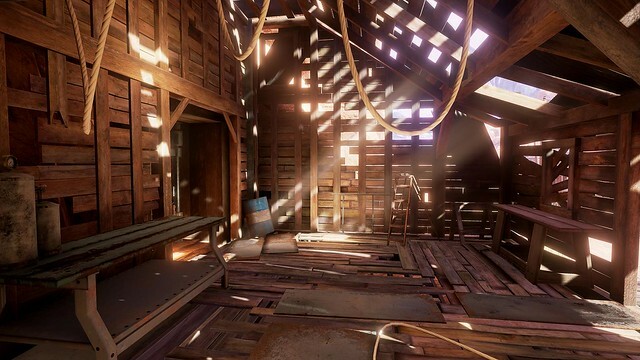 Obduction has an example of how that idea has to change in realtime 3D. 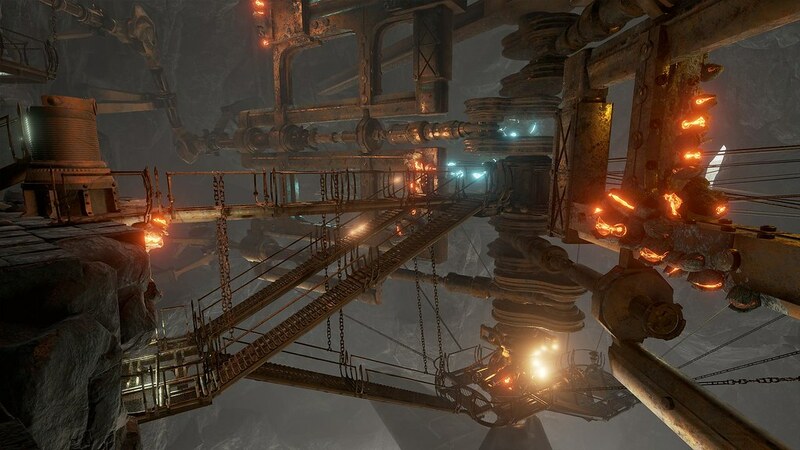 At the beginning of the game the player can only move forward through a canyon. At one point in the canyon a recorded message directs the player to a house with a white picket fence. At this point the canyon is almost gone, and the player has a choice to visit the house with the white picket fence or explore in various other directions. But we also built in a “pinch point” before the player can move on to another section. Approaching this pinch point triggers a rather large insect-like creature to fly out of a mine, across the prairie, and onto the roof of the house with the white picket fence. The idea being that if the player has chosen to ignore the house, we’d like to remind them that it was something that they were instructed to inspect. It’s a much larger and more dynamic hint to entice the player in a particular direction, but it serves the same purpose that the dagger serves in Riven. I must say that as much as I love realtime 3D it seems like it is always more awkward lining up with devices for interaction with them. Watching players get to the correct angle and the right distance can be cringe inducing – a little left, step back, too far, strafe right a bit, etc. It makes me think back fondly on the Myst 2D images where we control the exact position for optimal interaction. Did you have any of that frustration watching early players of The Witness? Interestingly, I feel like VR throws more challenges into this discussion – looking around is so natural and effortless, having the player look in a particular direction for a short time can feel like keeping the attention of a three year old. It’ll be interesting to see how our design evolves to embrace this. Jon: We didn’t have too many early players; I tend not to playtest very much! We had a bunch of players come and try the game at PSX 2015, but by then the game was mostly done being designed. Our game had the advantage that our main puzzles are discrete panels located at obvious places in the world, and we auto-position people to interact with most of these if they start to interact while in the neighborhood. But that solution wouldn’t work for most adventure games, because part of the reason it works is because you know exactly what is going to happen — in a puzzle more integrated with the environment, even if you knew it was going to auto-adjust your position, not knowing exactly where you would end up would lead to lots of frustrating moments by itself. Do you find that you change your puzzle designs much to make them less-interactively-awkward? I imagine there’s a limited extent to which puzzles can be adjusted, but beyond that they would break or just lose a great deal of their aesthetic appeal. Rand: There are definitely some puzzles that we feel more secure about – and are less likely to fiddle with. But we try to start behind-the-back testing early because players tend to do things that catch us off guard and require adjustments to friction, interface, and story delivery. And yes, we have only so much plasticity in how the puzzles can be adjusted because of the interwoven story/environment – it’s an interesting constraint that can be frustrating, but mostly just involves making sure our problem solving considers all the angles. The subtle clue solutions are the most fun for me – just a little tweak that has the perfect psychological effect – a flash of light on the other side of the world, a small 440 volt sign, a license plate on a desk, using consistent colors, etc. I love when those work to fix little issues, and even if they don’t work for everyone, they make the experience more about paying attention then just trying to get into our (the designers’) heads. Jon: The core gameplay conceit of Obduction (well, I think of it as the core) is really cool. I don’t want to say what it is, because I don’t want to spoil for readers this moment in the game when you first encounter this idea and start to understand how it works. But it’s interesting to me how many of the puzzles of the game are based on this idea, and on how the player can interact with it in different ways. Many of the puzzles are tied together by this consistency — as the player, I am building an understanding of how this thing works, and I get to be delighted each time I get to use this thing in a new way. Did you set out to design a game unified by a central puzzle concept, or did it work the other way around, where this idea started as something smaller, and then you realized how many different ways it could come into play? Thinking back to Myst V, that game had a bit of a similar thing, with the writing on the slate being the core of the game; do you see these things as playing similar roles? Rand: This is fun to discuss, because I think it’s similar to my impression of how you designed The Witness. We started with the simple idea of the puzzle mechanic — just a bare bones core — that we thought was interesting. As we continued to design the various worlds and levels we began to see different ways that the mechanic could be used. Interestingly, in our particular style of game, trying to balance that puzzle mechanic with the story and environment dampens our ability to continue the process and see how many more variations of that simple play mechanic might arise. Playing The Witness I get the distinct impression that you started with the smaller idea for the mechanic as well and extrapolated into amazing (and surprising) variations. The core gameplay mechanic in adventure or puzzle (or whatever you call them) games is always interesting to me. Seems like many indie studios are generally not feeling obliged to start with a tried and true mechanic (FPS, racing, sports, etc. ), instead opting to try new mechanics and friction to see where they go. That path is, of course, more risky, but has the potential to surprise players with great “ah ha” moments. Jon: One reason Witness took so long was just that I was doing a bunch of “design research” to chase down all the possibilities for those puzzles, yeah. But also, I know exactly what you’re talking about when you say that there’s an interplay between the puzzles and the story+environment that can make it hard to go beyond a certain point. In our case, I kept letting story be secondary so that the puzzles could be whatever they wanted to be — and even then, it took a great deal of work coming up with environments that somehow enabled these puzzles to exist. But since Cyan games are much more story-oriented, the tradeoffs are pretty different. Rand: This is one reason it was a nice change for me to play The Witness – the mindset is different. I was able to focus my attention on the puzzle clues and variations, with story elements adding flavor. I enjoyed Firewatch for a similar reason – I could focus on the story, and the puzzle elements added flavor. I really do enjoy our game design niche of balancing story, friction, and environment – as in Obduction, but after a few years of development it’s fun to play the alternatives. Jon: I think fans of Cyan’s games appreciate both the stories and the puzzles, so your particular mix is definitely working. In bringing Obduction to PS4, what kind of stuff did you tweak? Any major gameplay changes, or interactivity that was rearranged to suit the gamepad as the primary controller? PlayStation.Blog extends our thanks to Jon and Rand for taking the time for this Q&A. You can buy Jon’s latest game, The Witness, at PlayStation Store now, and you can pre-order Obduction for PS4 here ahead of its August 29 launch. I hope we get more chances to do this kind of thing! Any Q&A’s you’d like to see? What is that Ken up to these days? Hmmmm…. Justin thanks for putting this together. Was a great read and really is a meeting of the masterminds in this genre. Would be awesome to be a fly on the wall with these two talking together in person. I loved The Witness, and I’m really excited for Obduction too…even though I just learned about it a few weeks ago when it got posted on the blog! I just kicked things off, Rand and Jon are the ones to thank! But thanks to you as well for commenting — Obduction has certainly been more on my radar since we’ve started hearing more about it. What an excellent piece and great opportunity! The Witness and MYST are two of my all-time favorite games, in large part because of the ingenuity and creativity of their creators. Thanks Jon, Rand, and Justin for putting this together! Adding my support to the chorus here. This is an awesome blog post and I love seeing designers pick the brains of others and get a little look behind the curtain at what are the processes in building these games. Some of the best designers in the business here, so seeing them talk like this is great. I’m so excited to finally be able to play Obduction now! It’s a real shame then that Obduction makes this so painful to do in VR. I have to make a strict choice between teleportation and precise movement, and neither is entirely suitable for navigating the game. It would have been a much smarter design choice to enable both concurrently whether with a different mapping for each hand or a modal toggle. What an insightful interview. Loved The Witness and am totally looking forward to Obduction. I remember Myst way back and the time I spent involved. 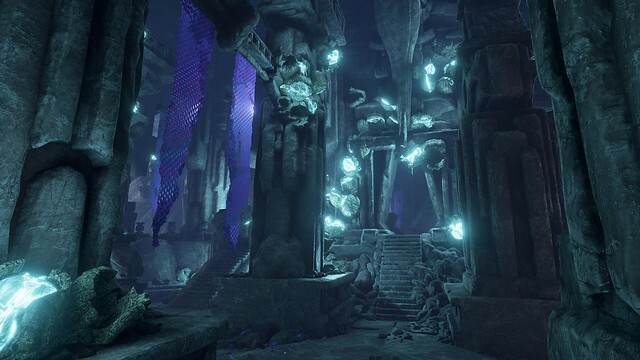 The environments for Obduction look fantastic. Has Jon ever hinted at a sequel for the Witness, stringing us to another island? !